Yesterday we reported that the Lumia 900 was available for pre-order in Canada and its price on Rogers will be $499.99, but there was still no word on when Nokia’s newest Windows Phone handset would be released. There is still no official word, but WMPoweruser is reporting that a reliable tipster has given them some insight into the Germany release. According to their site, the Nokia Lumia 900 should be released in Germany on O2 the second week of May, as in sometime between the 7th and 13th. 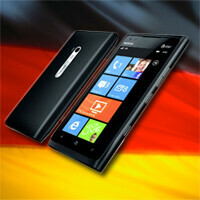 We doubt that Germany will be the first release, so if this rumor is accurate, larger Nokia Windows Phone markets may see the Lumia 900 even sooner. There has already been some skepticism about whether people will still be excited about a device that was announced at Mobile World Congress but doesn’t hit store shelves for a few months. Since that time frame is looking more like a reality, let’s hope the Lumia 900 turns out to be worth the wait. who cares about germany bring it to att!!!! If not Germany, you guys would still live in caves. And no, im neither German nor i live there. I hope ATT gets it for that $100 price point that the rumor mill has been swirling around. It's a shame I have to wait until July to get the phone. But who knows maybe since the Dark Knight movie comes out in July maybe the Dark Knight version will be released then too. Fingers crossed.